With Go Ahead Funding, small business owners in need of a business cash advance now have a hassle-free alternative to borrowing from banks. A business cash advance from Go Ahead Funding provides an immediate business cash advance electronically wired into your business account without the requirement of collateral and without the confinement of a strict repayment schedule. 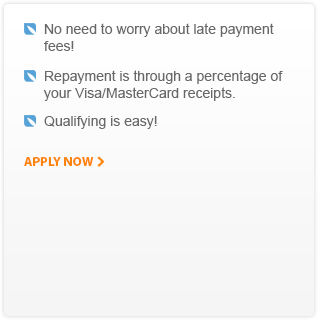 No need to worry about late payment fees, repayment is through a percentage of your future Visa/MasterCard receipts, freeing your time to focus on using your business cash advance to improve your small business. Qualifying for a Go Ahead Funding business advance is easy. In fact, over 80% of applicants receive their business cash advance within ten business days of applying. Pre-qualification is simple: if your business accepts Visa/MasterCard and averages at least $2,500 in monthly sales from Visa/MasterCard transactions for the last six months, Go Ahead Funding is your solution to your small business financing advance needs. Simply provide us with your last consecutive four months of VISA/MasterCard statements and meet our basic underwriting requirements. In about a ten days you'll have the cash you need to help your business succeed wired directly to your business bank account. It's that simple!